Gamification has gained a lot of attention in the online world as a way to engage customers and build loyalty. While many skeptics still struggle to understand how playing a game can have a real business impact, companies that have implemented external, customer-facing gamification have discovered that there’s far more to it than meets the eye. These programs have tremendous power to spur motivation and influence customer behavior. How does it work? Gamification applies behavior-motivating techniques from traditional and social games to non-game environments. An effective gamification program actually looks more like a loyalty program supercharged to help achieve real business goals when it is expanded beyond points, badges, and leaderboards. Certainly, customers are not the only constituents of any company for whom feeling engaged and motivated are important for fostering loyalty. Employees can also benefit significantly from gamification programs that create an environment in which they feel recognized and rewarded for their achievements, even beyond compensation and benefits. 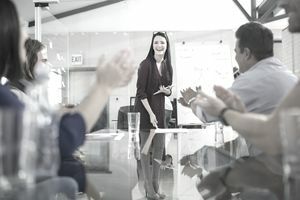 While it’s easy to see how you might use gamification in sales to motivate performance — or even in customer support services — to incentivize quick, satisfactory resolutions, the Human Resources function of any business can also leverage gamification techniques to incentivize and reward employees for completing important, but often mundane, tasks. You can easily turn the hiring process into a gamified experience by rewarding prospects with both acknowledgment and tangible perks for completing each step, from application to start date. Providing incentives can not only help attract qualified candidates from the start but can also dramatically increase onboarding efficiency as candidates are motivated to complete various steps to earn rewards. At the same time, much like a sales function, HR teams can also use gamification internally to reward top recruiters and incentivize employees to refer top candidates. The opportunity for an employee to earn Referrer of the Year status can encourage employees to take a more active role in talent acquisition, and even help relieve some of the pressure from the HR department itself. Keeping employees engaged and feeling like they’re part of the team is critical for retention. And, retention is paramount in maintaining valuable personal assets, institutional knowledge and consistency, and avoiding costly turnover. You can use gamification to promote a positive corporate culture by rewarding employees for cross-departmental collaboration, providing a process or product improvement suggestions, or even participating in company-wide volunteer programs, for example. You can use a gamified platform to track these activities and opportunities, as well as showcase employee participation to their coworkers to provide intrinsic motivation. As an added benefit, the platform maintains a record of all employee activities in the program, which is quite valuable information when it comes time to consider promotions, raises, and other tangible rewards. Mandatory HR training, like harassment, diversity, and other compliance programs are often not high on most employees’ priority lists, especially when they don’t see a relationship to their day-to-day job duties. Motivating them to take time out of their busy day to complete these programs in a specified time period can be challenging. Adding a gamification experience to the online learning program can spur action. Employees who earn rewards and recognition for having completed these tasks, or missions in the gamification lexicon, are far more likely to make it a priority. And, HR benefits from the ability to check those boxes for compliance in a timely fashion, without the pressure of having to hound employees to complete the programs. No one likes to complete paperwork, especially when other tasks are more pressing and exciting. But, paperwork is unavoidable in areas such as completion of benefits enrollment forms and expense reports. So why not make it fun? Similar to training applications, rewarding employees with either peer or management recognition — or even tangible incentives — for completing required forms can create a friendly competition where employees try to out-do one another for the title of best expense reporter or quickest to complete benefits update forms. It’s no secret that peer mentorship is a powerful motivator that drives employees to want to succeed. They see colleagues earning praise, achieving goals and climbing the proverbial ladder, and they want to know how they can achieve the same results. Using gamification, HR departments can create transparent, mission-based career paths that show the steps employees have taken to level up in the organization. For example, perhaps the top salesperson completes refresher training annually, turns in expense reports within a week of travel, keeps his/her prospect pipeline up to date, logs 5 new leads every week and follows up on two. By showcasing this behavior in a gamified platform, other employees can see what it takes to become the top salesperson as this mentor provides a breadcrumb path to show peers the way to the top. You can even design such programs to allow team members to recognize one another for contributions made toward a common goal. And, again, all of this data is trackable, creating a valuable historic record to capture employee and organizational knowledge. By consulting the platform, it’s easy to identify employees who have achieved certification in specific skills, worked with clients in a specific industry or make other connections throughout the data. All of this combines to create a more efficient, collaborative, productive and upwardly motivated workforce. To some, the idea of gamification sounds like a thinly veiled attempt to bait employees into doing what they should already be doing But the truth is, organizations can use gamification as an effective way to combat the employee engagement crisis in the U.S. According to a recent Gallup poll, 71% of American workers report feeling not engaged or actively disengaged in their work. This two-thirds majority translates into nearly $350 billion in lost revenue. Using gamification, HR executives and their teams can create a more interactive, rewarding and attentive workforce. It can help ward off worker malaise by leveraging intrinsic motivators to drive desirable employee behavior and improve efficiency and ROI while reducing turnover and churn costs.